Again this morning I craved my usual: flavored (sugary) tofu cream cheese in a bagel, with a huge coffee and a (fresh squeezed) orange juice. 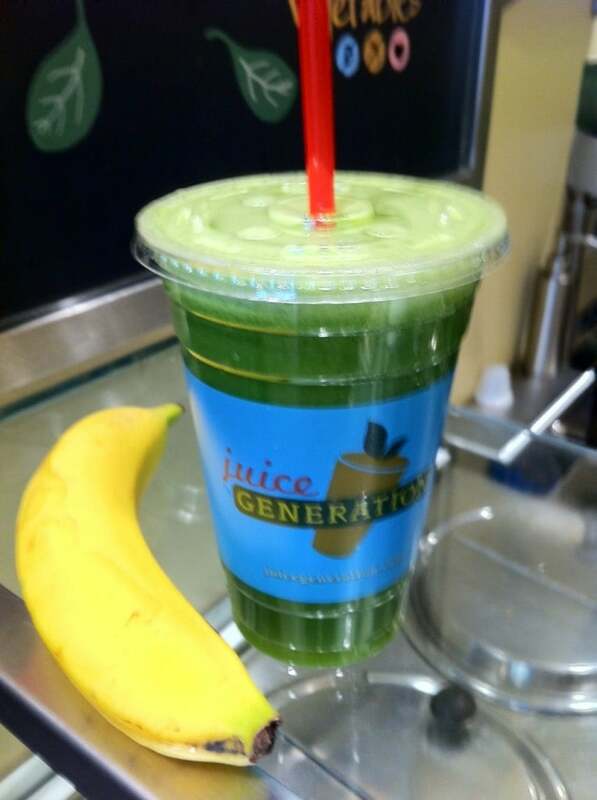 So I went to the same place I get my OJ from (Juice Generation) but instead I got a Supa-Dupa Greens which is a juice made from kale parsley romaine cucumber celery apple and lemon. I got a large. I also got a banana. While in line I overheard two women talking about the evils of seitan and how bad gluten is for you. I wanted to jump on and tell them to chill the F out, but I figured that for the time being anyway, that’s what I need to hear, anything to help me focus on whole, unprocessed foods. 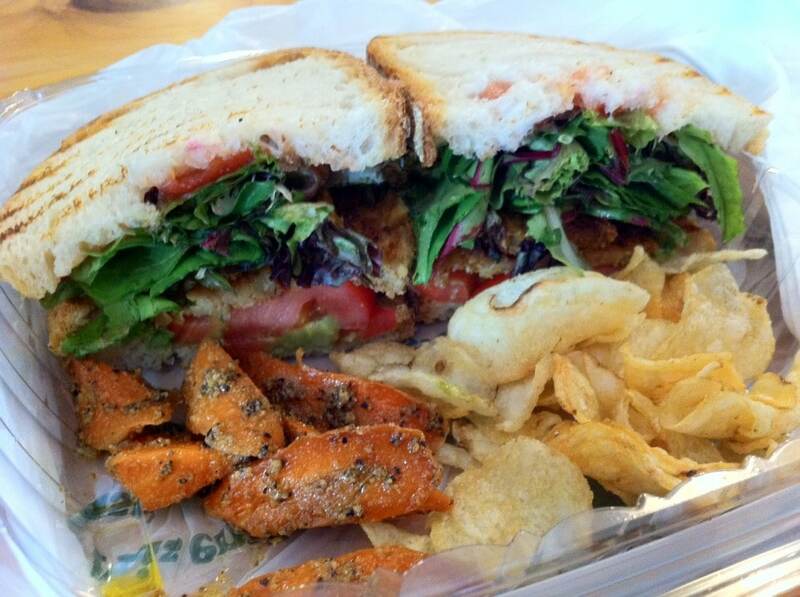 For lunch I had a “Not So Classic TLT” with smoke rubbed Barry’s Tempeh at Brooklyn Commune. Barry’s is a special homemade local brand of tempeh made by a guy in the area and it’s just heavenly! This had greens and guacamole and tomato and was served with some potato hips and some kinda marinated carrots. *editor’s note GOOD LORD THAT LOOKS FABULOUS! For dinner I went to my friend John’s restaurant, The Mansion, on the upper east side. Not a vegan place, but they have a delicious pasta puttanesca which I simply order without the anchovies and with no cheese. 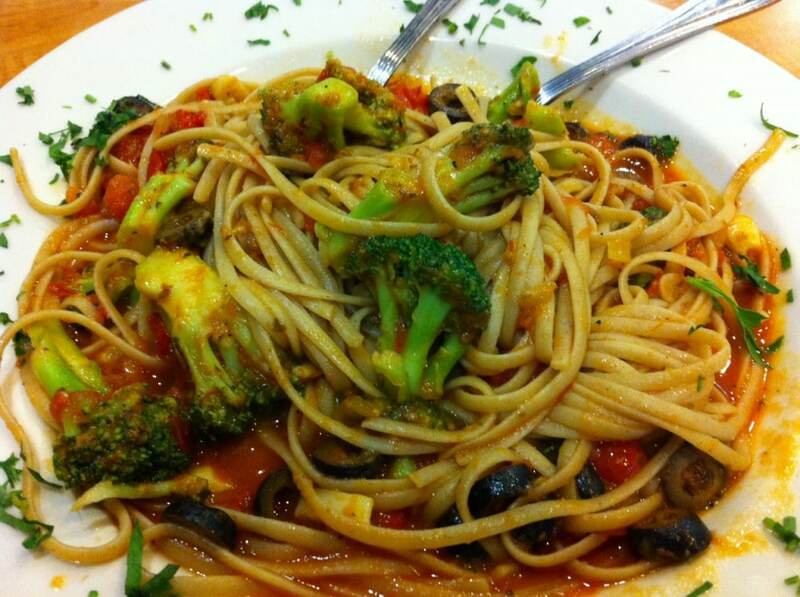 I forget exactly what’s in it (garlic, olive oil, black olives…) but I always ask for broccoli with it. Not a bad day. Not terribly green or raw, but I’m pleased with how I ate. Way to go Ben! Greenify that diet! Always a great reminder on how to make the ‘green choice’ or how to ‘add some green’ to an otherwise pasty dish. How are you greenifying Vegan Mofoers? What are your suggestions? Let us know! You certainly have inspired me. After reading your brown food post I went home and made a big huge kale salad!